The children of John Arden and Nancy Kay (Hill) McClain of Horton are happy to announce the 50th wedding anniversary of their parents. John and Nancy are the children of the late Kenneth and Lillian McClain and the late Roy and Hazel Hill. 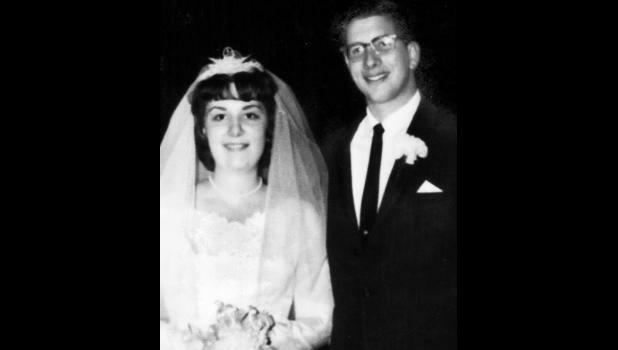 John and Nancy were married on Jan. 3, 1963, at the Horton First Baptist Church at 3 p.m. The Rev. Jimmie Treat performed the double ring ceremony. Attending the bride were Linda Ricks and Yvonne (Nevin) Hippensteel. Groomsmen were Bob McClain and Ed Libel. Their children are the late John Mark McClain of Tulsa, Okla.; Scott and Sara McClain and their children, Connor and Calyssa, of Manhattan; Sherri (McClain) Cunningham and Jeff Oxley and their children, Login, Landon, Noah and Katy, of Rantoul; Travis and Samantha McClain and their children, Emma and Mitchell, of Horton; and Shelly McClain and her fiancé, Tim Buser, of Horton. John and Nancy will celebrate their day with a family get-together and dinner in Horton. The two of them also plan to take a cruise later this spring. Cards may be sent to them at 1233 Second Ave. East, Horton, KS 66439.